Living a reckless life not only make such people candidates of Hell in the long run, but while still on earth they expose themselves to all sorts of nonsense. Just when you thought you've seen it all. A young lady was filmed jumping off the window from a building after the "real wife of the house came back unexpectedly". 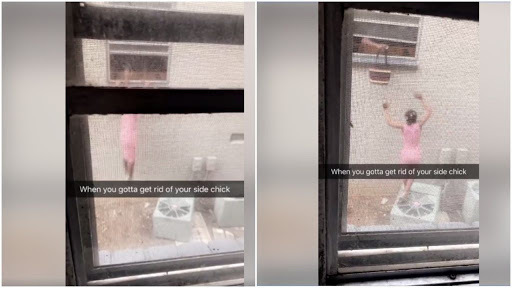 A clip which was posted online and has gone viral, shows the moment the unidentified lady was aided by the man as she jumped from the window. According to the woman who filmed the scene from her own building close by, the 'lady who is said to be a girlfriend - was gotten rid off by the male neighbour via the back window as he gave her her bag/belongings after she jumped out.